New Orleans, La. 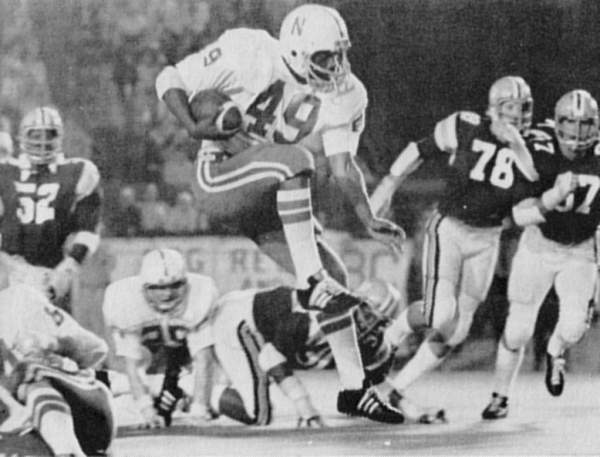 — (December 31, 1974) — Backed to the wall in the fourth quarter by a ferocious band of Florida Gators, the enraged Nebraska Cornhuskers stormed to a 13-10 Sugar Bowl victory. With 67,850 fans — including some 10,000 Nebraskans — holding their collective breath, Husker Mike Coyle booted a 39-yard field goal with 1:46 left in the game to provide the winning margin and trigger a giant celebration in the NU bench area. 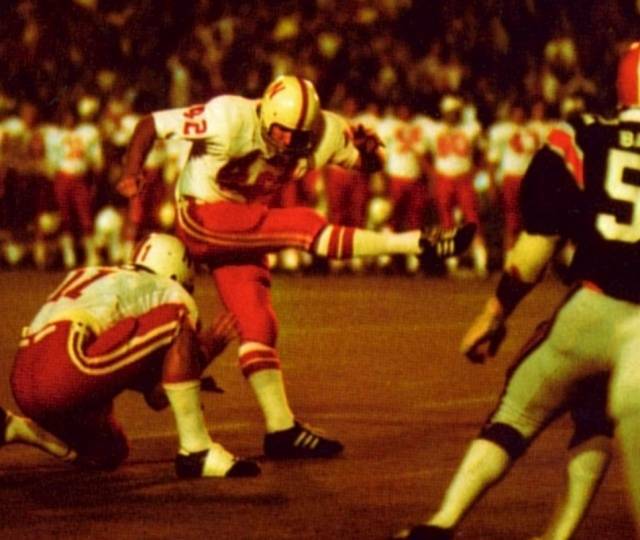 Coyle's boot — his second of the game — capped an unbelievable comeback and enabled the Huskers to tie Georgia Tech's national record of six consecutive bowl victories. It was a game of many facets, startling action, surprises galore and a Nebraska gamble of huge proportion. Florida struck early after All America Dave Humm's pass was intercepted and returned to the NU 21. On the next play Tony Green threaded his way through the Black Shirts and it was 7-0, Florida, with 9:58 left in the first quarter. That was the initial warning that Nebraska might be in trouble. Humm suffered the shakiest performance of his career as the record-smashing lefty managed only two completions in 12 attempts and had four murderous interceptions. As a result the Husker couldn't get untracked and just before the half, Florida drove to the NU 30, with David Posey booting a 40-yard field goal for a 10-0 halftime lead. Humm had no better luck in the third quarter and neither did the Black Shirts as Florida drove to the Husker one. It was at that point that the Huskers changed and so did their Luck. On a fourth down-and-one play, Jimmy Burrow tossed Don Gaffney for no gain and Nebraska had the ball, fatefully spared a 17-0 deficit. Coach Tom Osborne then took a cue from Humm's home town and gambled that a quarterback change might be in order. So in streaked Terry Luck to replace the Vegas lefty and Nebraska promptly marched 99-yards to score without a pass in the drive, Monte Anthony scored from the two and the Huskers trailed, 10-7. After holding the Gators and forcing a punt, Luck skippered the Huskers to the Florida 20 and Coyle kicked a 37-yard field goal to gain a 10-10 tie with 7:20 left in the game. Florida got one more first down, but had to punt again as the fired up Cornhuskers smelled victory. Luck got the ball at the NU 25 with only 4:08 left in the game. Could the gutty junior with three knee operations to his credit find the trigger for a third-straight scoring spree? Indeed he could, and the trigger was a bull-strong fullback named Tony Davis who promptly ripped 40 yards to the Gator 31. Husker partisans and reserve players went berserk with anticipation and three plays later it was fourth down at the Florida 22. In trotted Cool Coyle to apply the crusher on the valiant Gator team that had almost halted Nebraska's bowl string. Nebraska won the game of statistics, too, with 304 yards rushing and a 320-275 total offense bulge. But in the final analysis, it was a brilliant defensive stand, a gutty quarterback change, an unstoppable last-quarter ground attack, a fierce determination to avoid defeat and a talented side-winding toe that brought victory to the Nebraska Cornhuskers. Sugar Bowl Footnotes ... Tony Davis, who gained 126 yards, was named Outstanding Player of the game, the same honor he won in the Cotton Bowl a year earlier ... Monte Anthony got 64 yards, John O'Leary 50 and Don Westbrook 46 ... Humm's two passes to Westbrook (for 16 yards) were the only completions for Nebraska in 14 attempts ... Husker Tom Pate led all defenders with 11 unassisted tackles and three assists ... Husker defenders sacked the Florida quarterback five times, but the NU offensive line didn't permit a single one.